Where to surf in the canary islands? At the moment we offer Surfing Holidays and Surf Camps to the islands: Lanzarote, Fuerteventura and Gran Canaria. A short-haul destination for most European travellers this volcanic island chain off the coast of northern Africa offers warm, crystal-clear water, epic pounding surf and plenty of sunshine all year round. Tailormade Surfing Holidays, Surf & Yoga, Budget Surf Camp, ISA Surf School, Improver Surf Clinics, Longboard Coaching, Guided Surfaris , Surf & Kite Camps. Tailor made Surfing Holidays including handpicked accommodation, Budget Surf Camp, ISA Coaching, Improver Surf Clinics, Surf & Kite Camp. All inclusive or self catering surfing holidays ideal for single travellers, couples and families. Learn to surf with the 3 times Spanish champion in the capital city of the Canary Islands. Budget surf camp accommodation on Las Canteras beach next to pubs and bars. Guided Surfaris also available. The quality and diversity of the waves, the pleasant climate all year round, excellent tourist facilities and short flights times from most European cities combine to make the Canary Islands a suitable destination for all levels of surfers all year round. Experienced surfers will find a wide range of challenging waves from October to April when powerful Atlantic swells produce heavy, consistent waves with near Hawaiian power on the reefs and points dotted around the north shores of Lanzarote and Fuerteventura. There’s also the outer islands of La Graciosa and Los Lobos to explore plus some hidden gems! 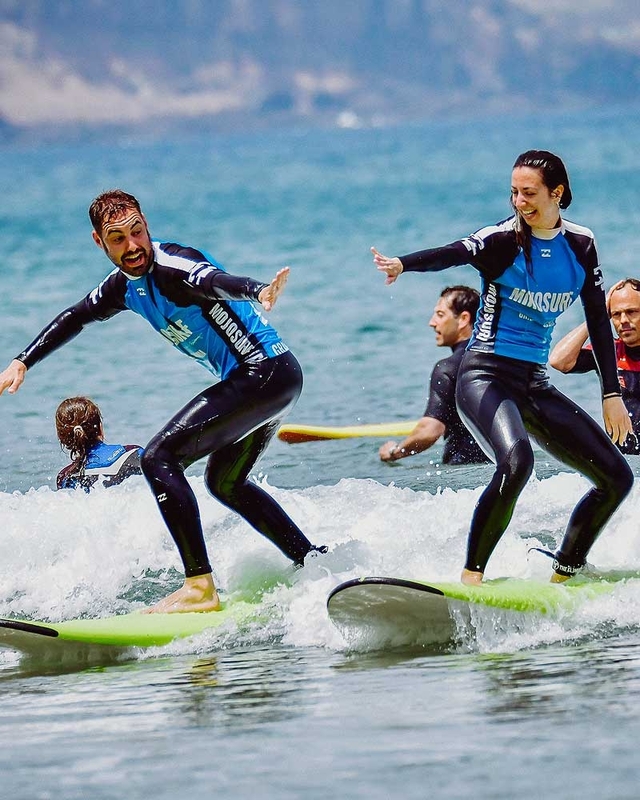 People new to surfing and beginners will prefer the waves in Playa Famara in Lanzarote or El Cotillo in Fuerteventura that typically break over a sandy bottom and are mellower than their counterparts especially during the summer months from May to Sept. The beaches of Gran Canaria are ideal for beginners. Intermediate surfers will find more challenging conditions in the Autumn time from September onwards. The islands of Lanzarote, Gran Canaria and Fuerteventura make up part of the Canary Islands Archipelago and together cover approx. 7,447 km2 of starkly contrasting landscape and breathtaking scenery. These 3 islands were all shaped by intense volcanic activity that was both a blessing and a curse. The deep ravines, lush valleys, rugged canyons, golden sand dunes, and white-sandy beaches are all products of their volcanic past. Lanzarote, Gran Canaria and Fuerteventura are the perfect island destination for tourists wanting to escape the snowy European winter and people wanting an adventure holiday. Waterports are the primary recreational activity in the Canary Islands and these 3 islands get the best waves and wind of the whole chain of islands. The Islands of Lanzarote, Gran Canaria & Fuerteventura boasts some of the best beaches in Europe where you can surf, windsurf, kitesurf and dive to heart’s content. Volcanic craters, frozen lava rivers, and miles of golden sand dunes offer exciting and unusual visual treats to people visiting the Canary Islands.